Your spending history is an accumulation of past decisions. This report makes those decisions visible, so you can choose which to keep making and which to change. The Spending report shows spending in your Budget accounts, from the biggest of big picture down to individual categories, and even individual transactions. As the Spending report is based on categories, the only tracking account activity included in this report is transfers from Budget accounts to Tracking accounts. The donut graph is the Totals view of the Spending report. Each section represents a category group in your budget. Click on one to drill down into just that group. Then click a specific category to see the list of transactions. You can even click a transaction, which will take you right to it in your account register in case you need to edit it. The sidebar in Spending Totals will update as you drill down into each level, showing you the totals for all visible sections of the graph. Type the payee in the search box. Check the select-all checkbox to select all the transactions. You'll see a Selected Total in the upper right corner. If you're interested in total inflows by payee, switch over to the Income v Expense report. 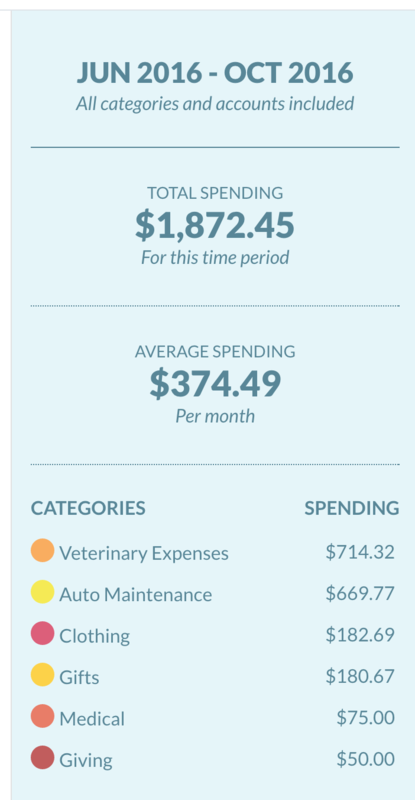 In the Trends view, you can see how your spending has changed over time. You can drill down in the same was as the Spending Totals view. Or if you're more the spreadsheet type, you can export the report.